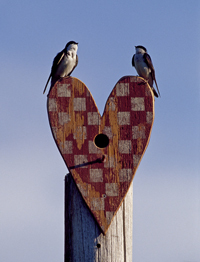 Wood River Valley photographer Kirk Anderson’s photograph “Love Birds” shows two swallows setting up housekeeping in a heart-shaped birdhouse against a blue sky. Anderson’s photography gallery will be open during Gallery Walk this evening from 5-8 p.m. at 115B Northwood Way in Ketchum’s light industrial area. The Sun Valley Gallery Association encourages all Gallery Walk attendees to come out at 5 p.m. and enjoy visiting galleries and businesses throughout Ketchum before the opening ceremonies of the Winter Olympics. How would increased spending affect SV residents? Lawsuit filed against Sun Valley Co.